Italian Meringues (Jarrin) Twelve whites of eggs 1 pound of sugar half a pound of almonds Make the paste exactly as for the dry meringues & add the almonds cut into lengths with a few [illegible] lined orange flower have nearly square paper cases rather deep & put in your paste Ice the meringues with sugar as above & bake them on a tin sheet. 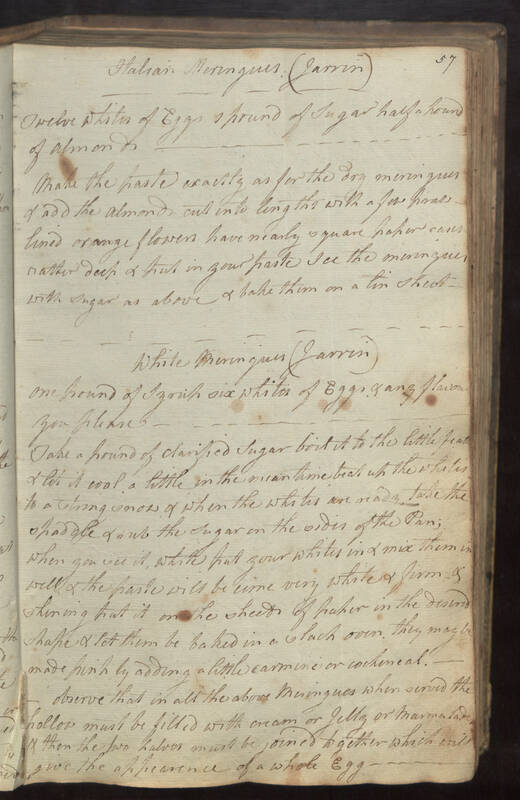 White Meringues (Jarrrin) One pound of syrup six whites of eggs & any flavor you please Take a pound of clarified sugar boil it to the little [feather?] & let it cool a little in the meantime beat up the whites to a strong snow & when the whites are made take the spaddle & rub the sugar on the sides of the pan; when you see it white put your whites in & mix them in well & the paste will become very white & firm & shining put it on the sheet of paper in the desired shape & let them be baked in a [slack?] oven they may be made pink by adding a little carmine or cochineal. observe that in all the above meringues when served the hollow must be filled with cream or jelly or marmalade & then the two halves must be joined together which will give the appearance of a whole egg.